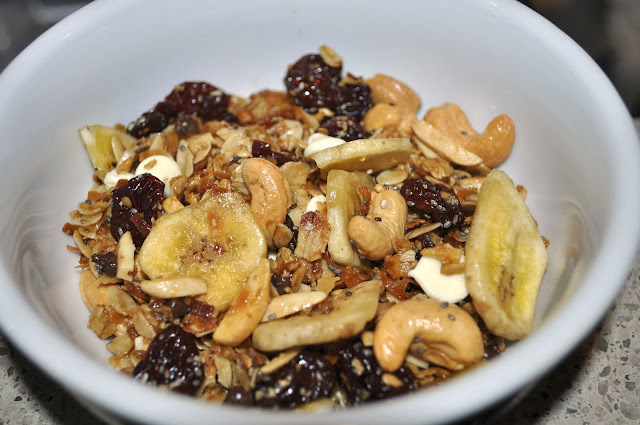 I've been craving snacking granola this week and it dawned on me as I perused foodzie (for the hundredth time) and considered other fruit/nut combinations at my mixed nuts, that I could make my own. So I did! In a large bowl combine the oats, coconut, almonds, flax seeds and chia seeds. Pour in melted coconut oil and honey, mix until all the dry ingredients are evenly coated. Spread onto a baking sheet and bake for 45 minutes or until the granola is nicely toasted and brown. Turn the granola every 10 minutes or so to ensure even cooking. When the granola is mostly cool, add in the banana chips, cherries, and cashews. Once the batch has cooled completely add in the chocolate chips and store in an airtight container. This recipe provides a nice granola base to which you can add whatever yummies you're in the mood for. That's so funny because just earlier today I was looking up recipes to make my own protein bars. I'll have to add this one to my list too...looks delicious!